In a study of over 75,000 calls, tech support hotline Gadget Helpline found that nearly two-thirds of male callers didn’t bother to read the manual for their product before calling in with a problem. A different study of three sample groups given paper and computerized surveys found that up to 46% of participants skipped over key instructions in the survey. The conclusion? Most people are prone to skipping the prose, particularly if there is an action they can take instead. And technology is hardly the only area where we’re victims of a lack of research. Within the financial industry is a systemic consumer awareness problem, one that likely stems from a lack of proper financial education. In fact, according to several surveys, many consumers lack key personal finance and credit knowledge, including basic awareness of how to build their credit scores. Though relatively unknown just a few decades ago, today’s consumer credit marketplace is almost entirely driven by your credit score. A numerical representation of your overall creditworthiness, your credit score will determine not only if you’re approved for credit, but also the rates and fees you’ll be charged for that credit. Despite the vital importance of maintaining a good credit score, however, a surprising number of people are still in the dark. When LendEDU surveyed 500 people between the ages of 17 and 37, the company found that 25% of respondents couldn’t correctly describe what a credit score is, let alone how to build one. 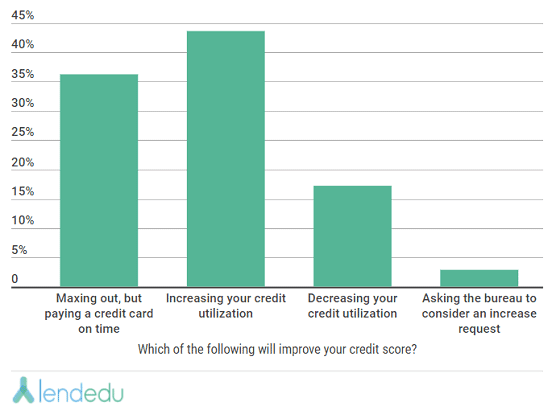 Nearly half of respondents incorrectly thought increasing credit utilization would improve their credit scores. When LendEDU surveyed 500 millennials, nearly 44% mistakenly believed increasing their utilization rate would improve their credit scores. And that credit misinformation is hardly limited to young people. According to a recent NerdWallet survey, a full 64% of respondents were under the impression that their credit score is posted on their credit reports (hint: it’s usually not), and 23% of respondents mistakenly believe they have only one credit score (you can actually have dozens). Many consumers are also unaware of how to reach the top tiers of credit scores, with 10% of surveyed consumers believing you simply start out with a perfect credit score. Unfortunately, the reality is a lot less perfect; while it’s possible to reach a perfect 850 FICO score — and millions of consumers have — you work your way up to that level. 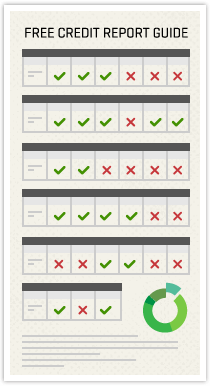 It takes at least several years, and often close to a decade, to obtain a perfect credit score. And carrying debt won’t necessarily help you reach that perfect score, despite the fact that 41% of NerdWallet respondents believe carrying a small balance from month to month improves your score. The truth is, in most cases, carrying a balance likely won’t help your credit score at all — but it will likely cost you interest fees. Unhappily, the consumer awareness problem isn’t limited to confusion over what a credit score is and how to maximize it. Many consumers are also strongly underestimating the overall impacts of having bad credit, particularly the fact that having a low credit score can impact more than just your financial life. That’s because lenders aren’t the only ones who look at your credit reports and scores. NerdWallet’s survey showed about half of consumers don’t know the full effects of bad credit. For example, applications for a variety of products, like insurance, can result in a credit inquiry. But more than two in every five Americans don’t realize that having bad credit can actually affect how much you pay for car insurance, with lower scores often meaning higher premiums. 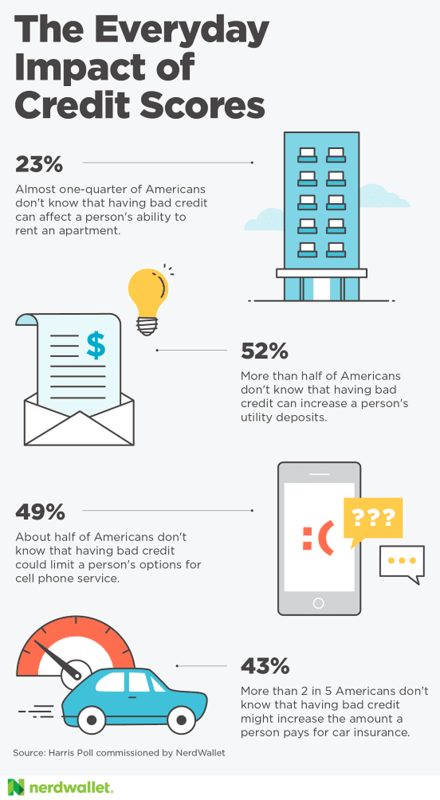 Furthermore, nearly half of surveyed consumers don’t know that bad credit can also impact your ability to obtain a cellphone. And while more than three-quarters of consumers recognize that poor credit can affect your ability to rent an apartment, more than half didn’t know that your credit also impacts your ability to set up vital utilities. In both cases, the lower your credit score is, the more costly living expenses can get, with poor-credit consumers often needing hefty deposits to secure a rental or set up utility services. 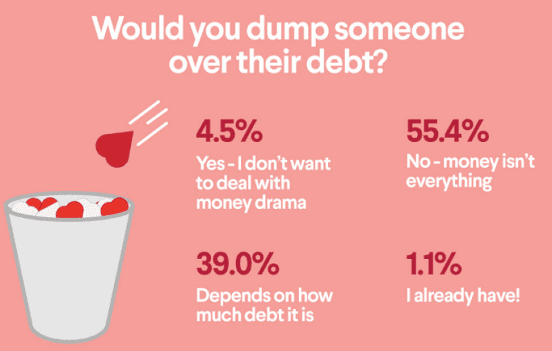 According to one SoFi survey, nearly 45% of people have or would consider dumping someone because of too much debt. If that’s not enough to encourage you to get your personal finances in line, your bad credit and personal debt might be dampening your dating mojo, to boot. More than 20% of SoFi survey respondents listed serious debt as a serious deal breaker when it comes to finding a romantic partner — and nearly half have or would consider dumping a date because of too much debt. With so many people falling into consumer finance information gaps, it begs the question, what’s the problem? Are people simply not reading the proverbial instruction manual, or is there a larger issue? Well, as it turns out, the problem may be that many consumers are never given an instruction manual in the first place. In past years, the job of teaching children the basics of personal finance belonged to the parents, and key financial skills, like how to balance a checkbook and build credit, were learned in the home. These days, however, that doesn’t seem to be the case, as 69% of parents are reluctant to discuss financial matters with their kids at all, let alone often enough to pass on those necessary skills. When the Champlain College’s Center for Financial Literacy looked at national data on high schools across all 50 states and the District of Columbia, it found that the US is a long way from financial literacy. Indeed, only five states earned an “A” in financial literacy education according to the Center’s guidelines, and nearly a third of all states scored a “D” or “F” grade. 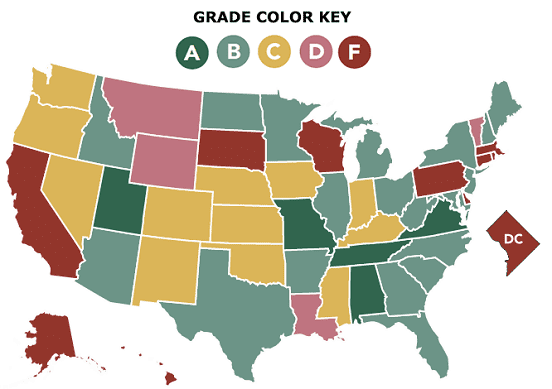 Only five states earned an “A” grade on the National Report Card on High School Financial Literacy. Some of the worst areas for most participants were Retirement Readiness and Other Investing — the vast majority of people scored a “C” or worse — as well as overall Financial Knowledge, with roughly one-third of consumers earning a “B-” or higher. And while the majority of people did well in the Savings and Spending category, the results for the Total Credit and Protect and Insure categories were a mixed bag, at best. Let’s face it, instruction manuals are boring. Who really wants to read 20 pages on how to operate your new piece of electronics when you can learn the fun way — by playing with it? But while skipping a little research on your new vacuum cleaner will just leave you with a dirty house and a 30-minute call to tech support, some things in life are not as easy to repair as a buggy vacuum. Given the serious problems in our current methods of personal finance education, skipping the metaphorical manual is no longer an option. We need to start taking responsibility for our own financial education — and that of our children — if we want to be successful in life. Few people can blindly stumble into wealth and security, but it’s dangerously easy to wind up with poor credit and limited options. Fortunately, it’s easier than ever to self-educate in any number of areas, including important personal finance topics like building credit and handling debt. You can also find a wide variety of websites and mobile apps providing free credit scores and reports, budgeting tools, and other resources to help you stay on the right track.